I will add the rest as soon as they surface in my memory. This page talks about theories, but not the kind of theories that you can see in modern YouTube videos. All of these theories are backed by facts, but there is no definitive proof that they are true (unless stated otherwise). It is actually possible that Debug Mode was left accessible in the games intentionally. In the Jak 3 (September 2004 Preview), the button sequence for activating Debug Mode is shorter. The longer sequence is used again for the retail version of Jak 3. It is possible that the devs planned more areas for this game. We do not know if they ever made any levels that can not be found in the retail version of the game (apart from "halfpipe"). A different version of the map of this game can be found among the files of the Jak II (Earlier Demo). 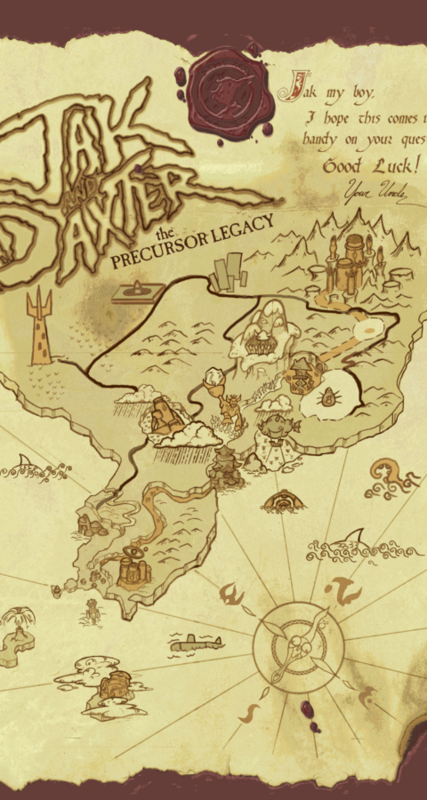 It might be older than the final map, since several unknown areas appear on it that can not be found on the final version of the map. Though it is also possible that a dev was just being creative and drew things over the final map. The map that was found. It is hinted that at one point in development, you had to fight the Baron at Weapons Factory instead of Krew. In the Jak II (Later Demo), there is an inaccessible mission named "Beat Baron in Weapons Lab". In the final version, the mission's name has "Krew" instead of "Baron" in it. It is likely that there was going to be some kind of music for the Gun Course of Jak II. The game tries to play music while you are in the Gun Course area, the missing music is called "gungame". If you put a MUS file into the MUS folder and name it "GUNGAME.MUS", the game will play it while you are in the Gun Course area. Even the Jak II (Earlier Demo) tries to play the music "gungame" at the Gun Course, but it does not have that music file either. The Weapons Factory either has no music or plays the music of the Palace, depending on how you reach it. However, it is likely that when it plays no music, it was originally supposed to play the unused alert music of Palace/Weapons Factory/Mar's Tomb. When the "Get Heart of Mar in Weapons Lab" mission is active and you use the Air Train to go to the Weapons Factory, the game will set the "alert variation" to 2 as soon as Jak exits the Air Train. However, no alert variation higher than 1 will ever work in the game. The game only uses alert variation 0 and 1. It is quite clear that Naughty Dog wanted to do something with the music of this mission. Jak standing on solid ground, far from the intended playing area of the level. 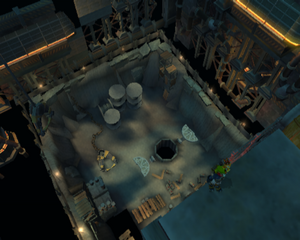 The Construction Site is a very unimportant area in Jak II, but some things are hinting that the devs had more plans for this level. The level has a lot of collision at places that you could not normally reach. Check the Construction Site - This is the one that you can see in the game. Climb Construction Site - There is really not much to climb here so it is likely that something was removed from the area along with this mission, or the mission (along with the climbable structure) was never even made. Find Baron at Construction Site - You do meet the Baron here in the game, but you did not know this before going there. It is likely that the developers wanted to have KG robots in the city at some point in development. There is a city "asset pack" in the game that, compared to the city's default asset pack, lacks fat citizens and zoomer-riding citizens. Instead, it has the KG robot that you can find at Weapons Factory. Sadly, there is no way to load this asset pack. The Play as Jak II Secret in the Jak 3 Preview. 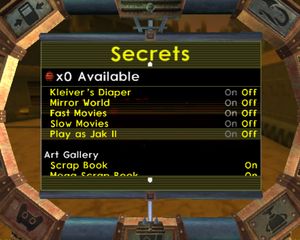 Confirmed, see the Jak 3 (September 2004 Preview), which indeed has this in the Secrets menu. This theory is about a supposedly removed option from the Secrets menu, specifically one that would have allowed you to play as Jak from Jak II. There is unused text in Jak 3: "Play as Jak II"
You can make Jak look like Jak from Jak II by editing the game's memory at the same place where the current status (on, off, etc...) of items from the Secrets menu are kept track of. 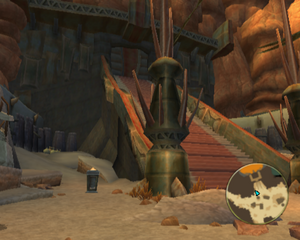 The stairs leading to Spargus Arena in Jak 3 (Earlier Demo). It is quite likely that the developers wanted to have selectable arena challenges in Jak 3, similar to the Stadium's challenges in Jak II. The Complete Arena Training Course mission of Jak 3 (July 2004 Internal) displays High Scores at the end of the mission, similar to how you can see High Scores at the end of races in Jak II. This implies that this mission was planned to be replayable in the Spargus Arena. There is an inactive side mission computer near the stairs to the Arena in Sparugs City, in the Jak 3 (Earlier Demo). It is not there in later versions that we have of the game.